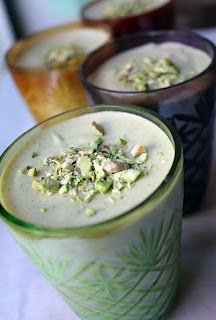 place pistachios and milk in a blender and blend for a full 2 minutes. line a sieve with a damp kitchen towel or cheesecloth and pour pistachio milk into it. squeeze out milk and discard solids. stir in almond extract and pinch of salt. sprinkle gelatin over cold water and let stand 1 minute. in a saucepan over medium heat, heat milk and sugar until sugar is dissolved. add gelatin and stir until it is dissolved, do not overheat. remove from heat and cool until just thickened. fold in whipped cream. spoon into serving dishes. let chill minimum of 6 hours, or overnight.